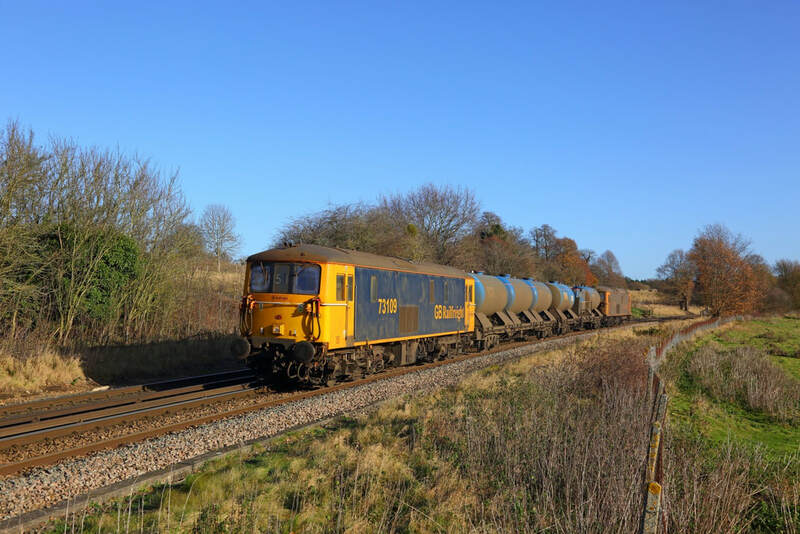 GBRf ​73109 tnt 73141 on the 6Y51 Slade Green to Tonbridge at Teston on the 26th November 2017. 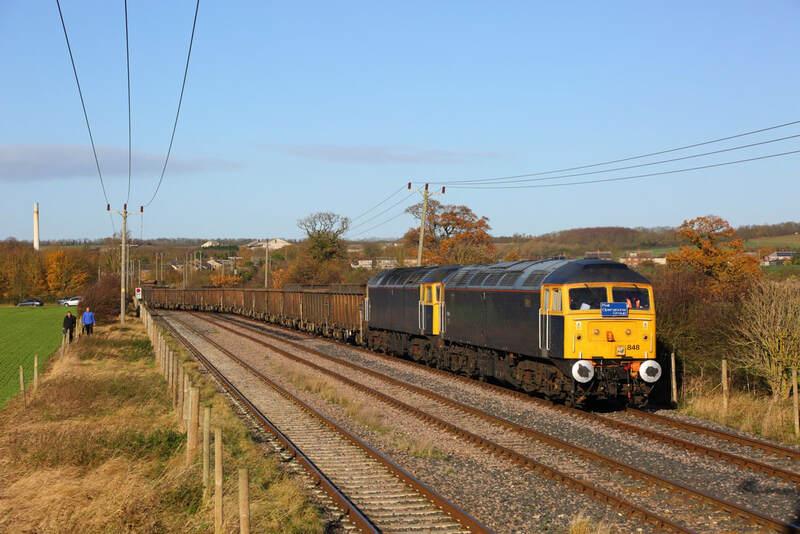 DRS 20302+20312 on the 3S14 1131 Sheffield to Hull at Welton, Brough on the 25th November 2017. 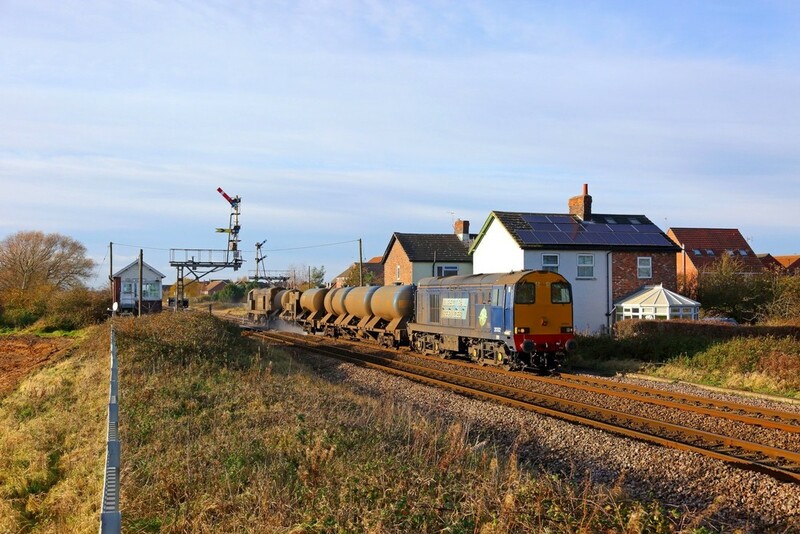 ​The semaphores are due to be replaced at Easter. 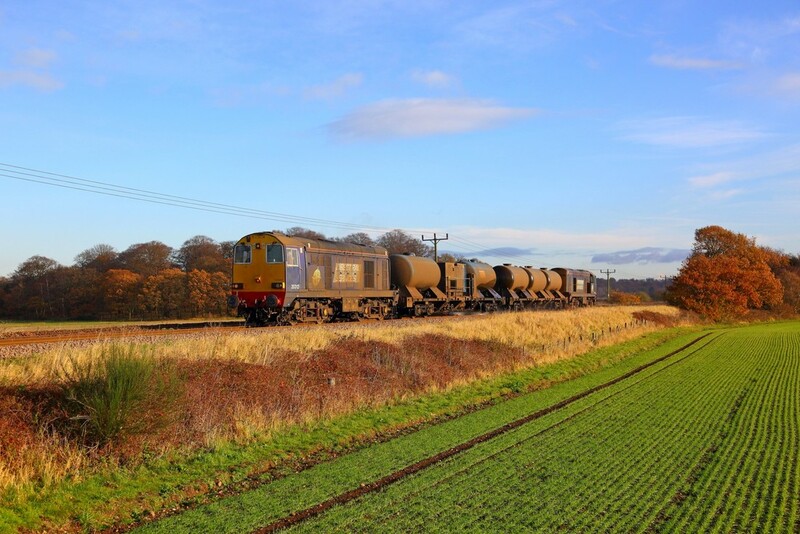 DRS 20312+20302 on the 3S13 Sheffield to Sheffield via Gainsborough at Babworth returning to Sheffield on the 25th November 2017. 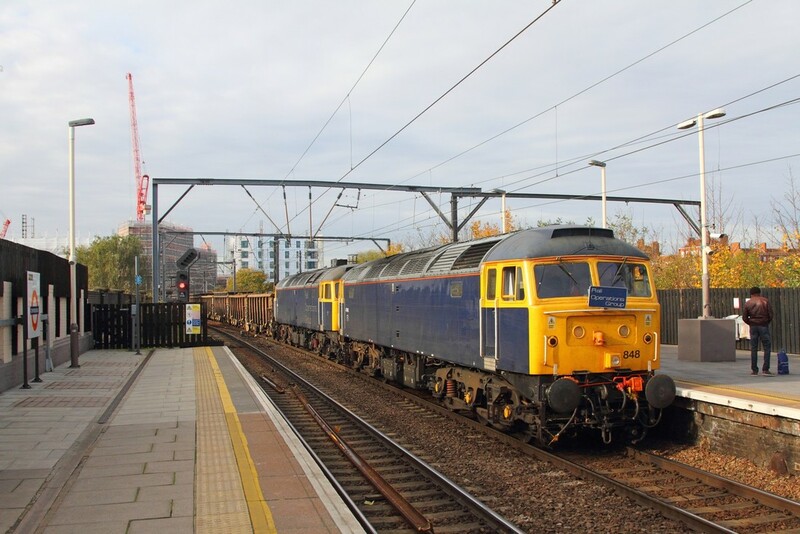 GBRf 66778 propels Eurostar 3103+3104 into Kingsbury for scrapping as train 6X73 St Pancras to Kingsbury on the 25th November 2017. 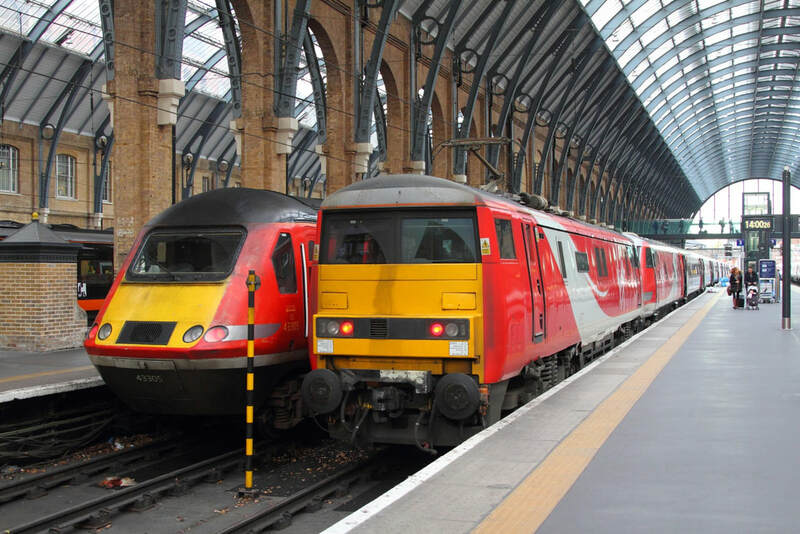 Virgin East Coast 91107 blunt end working 1E06 Glasgow Central (from Edinburgh) to London Kings Cross at Kings Cross on the 24th November 2017. 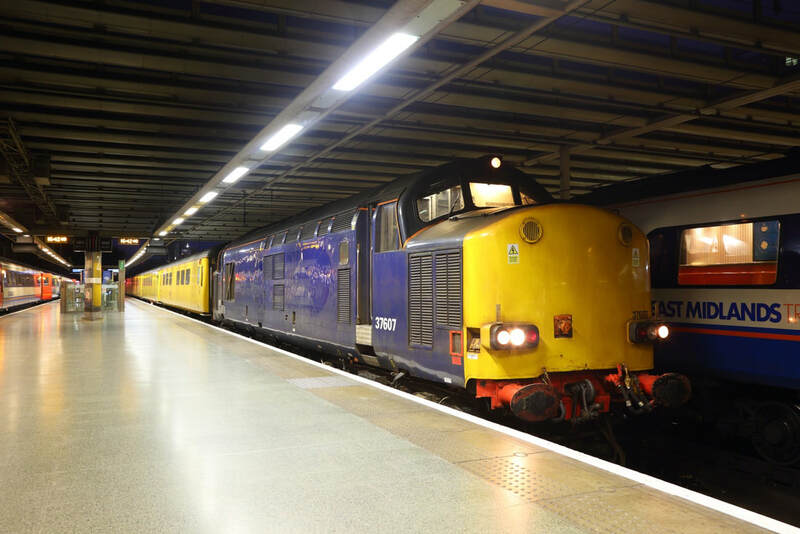 DRS 37607 now debranded leads 37611 arriving into London St Pancras with the 1Q51 from Derby RTC vice NMT on the 23rd November 2017. 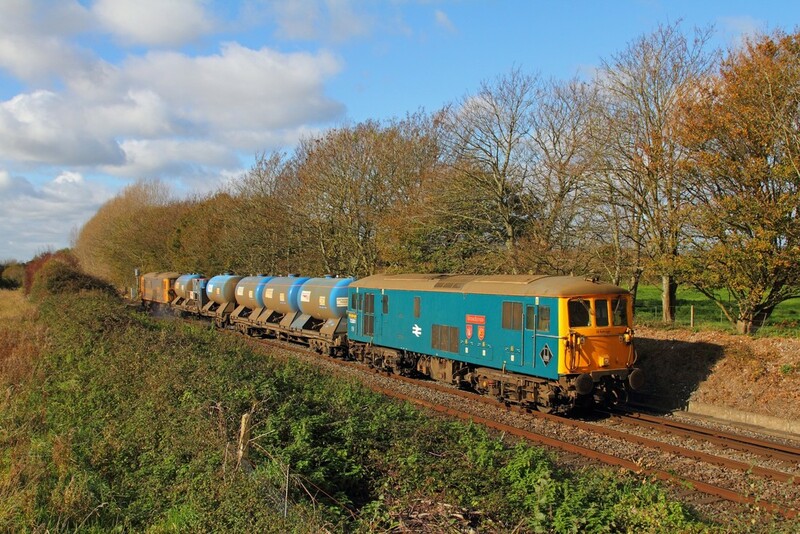 ROG 47815+47848 on the 6T02 Barrington to Wembley at Shepreth on the 23rd November 2017. 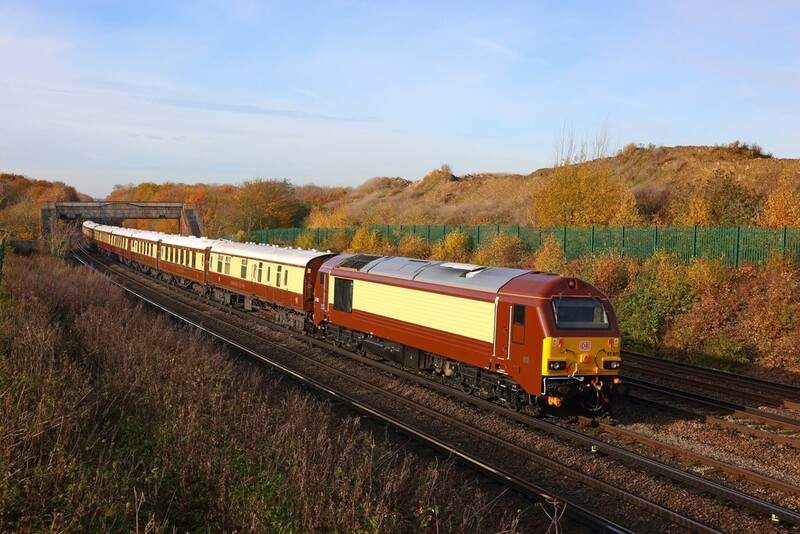 ROG ​47848+47815 on the 6T02 Barrington to Wembley at Foxton exchange sidings on the 23rd November 2017. 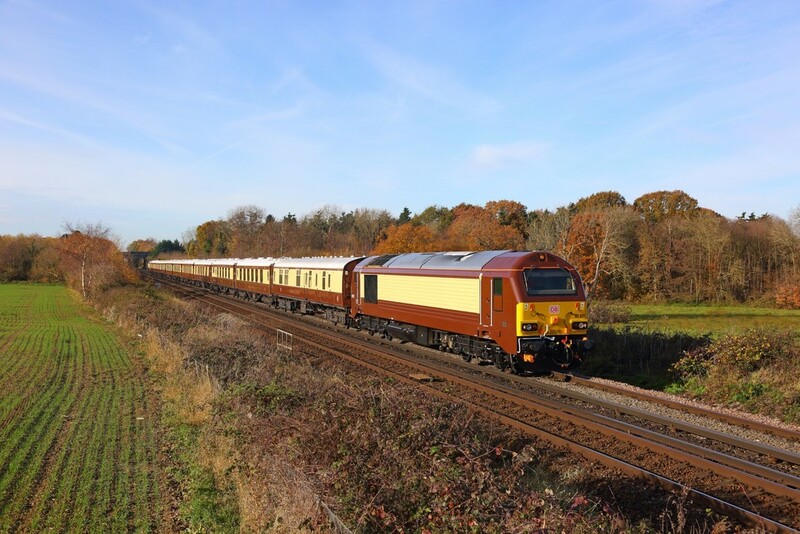 67021 tnt 67024 on the 1Z87 London Victoria to Paddock Wood east of Tonbridge on the 19th November 2017. 67021 tnt 67024 on the 1Z87 London Victoria to Paddock Wood at Swanley on the 19th November 2017. 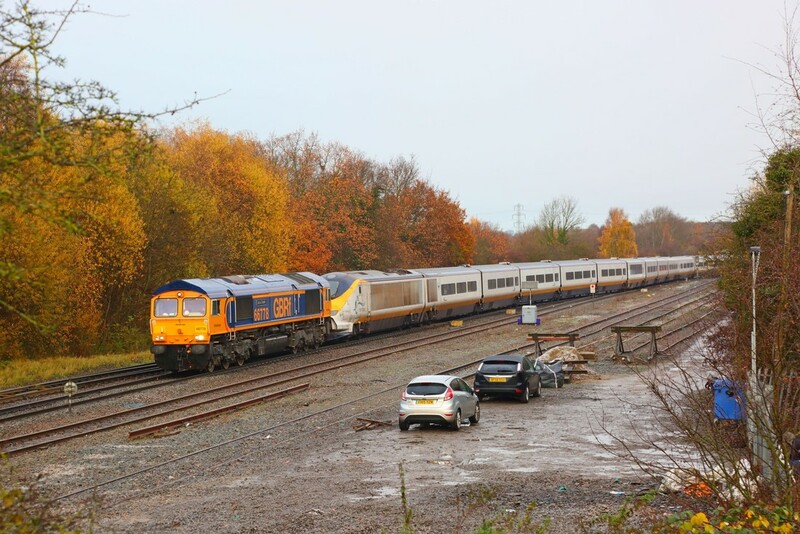 GBRf ​73212+73109 on the 6Y51 Slade Green to Tonbridge west yard at Swanley on the 19th November 2017. 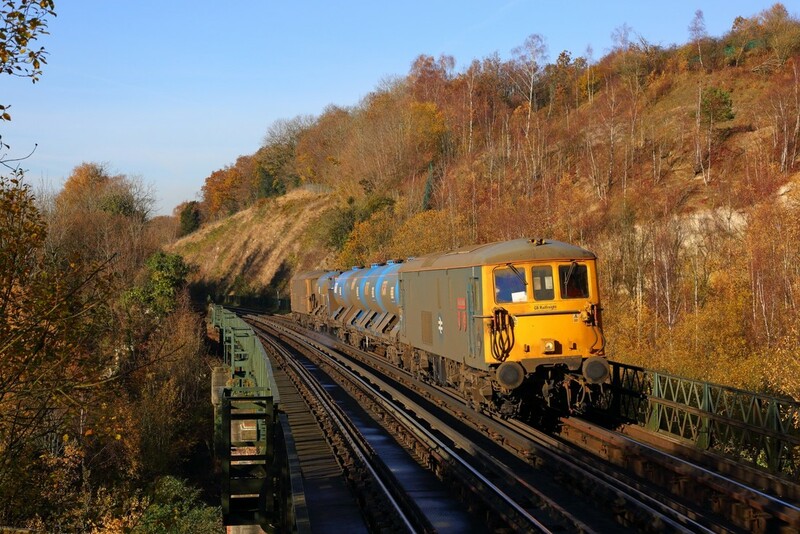 Br Blue ​73201 tnt 73128 on the 3W90 Tonbridge West yard circular via Newhaven, Willesden, East Grinstead and Uckfield at Riddlesdown viaduct on the 17th November 2017. 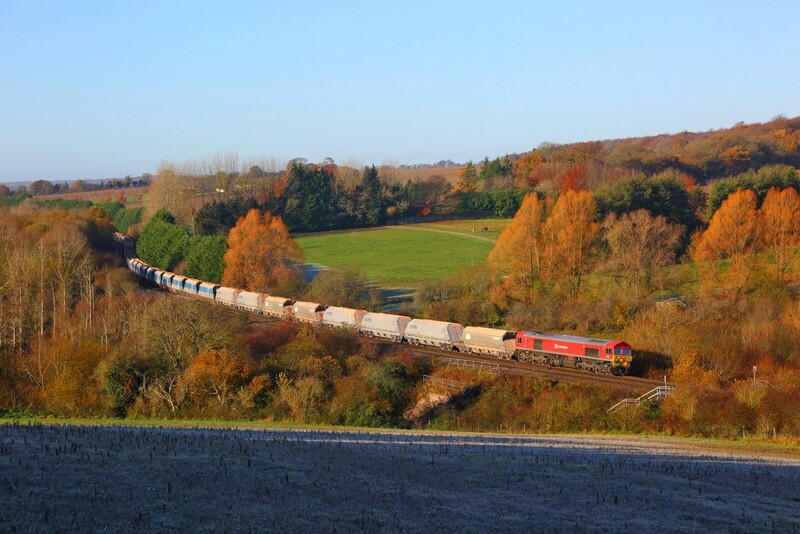 DB Schenker ​59203 on the 7A09 Merehead to Acton yard at Hungerford on the 17th November 2017. 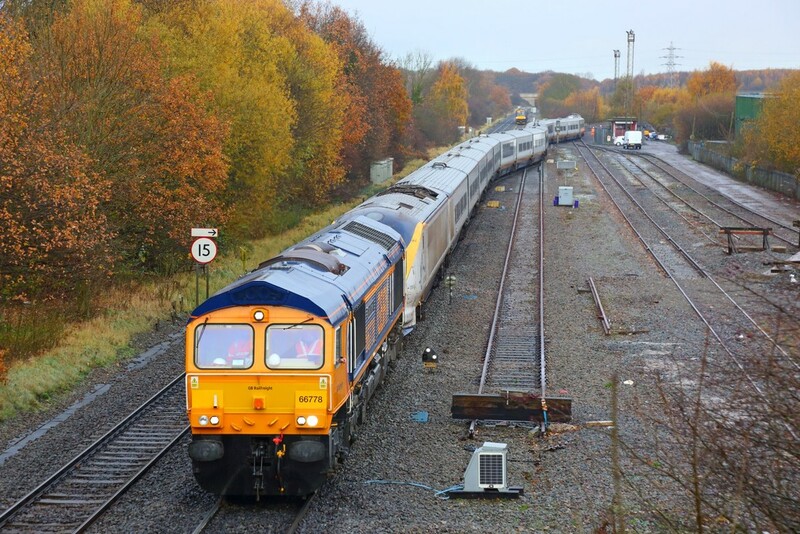 56301 still in the remnants of the former Fastline livery, powers the 6L74 Wembley to Barrington unloading PAD train at Camden Road on the 16th November 2017. 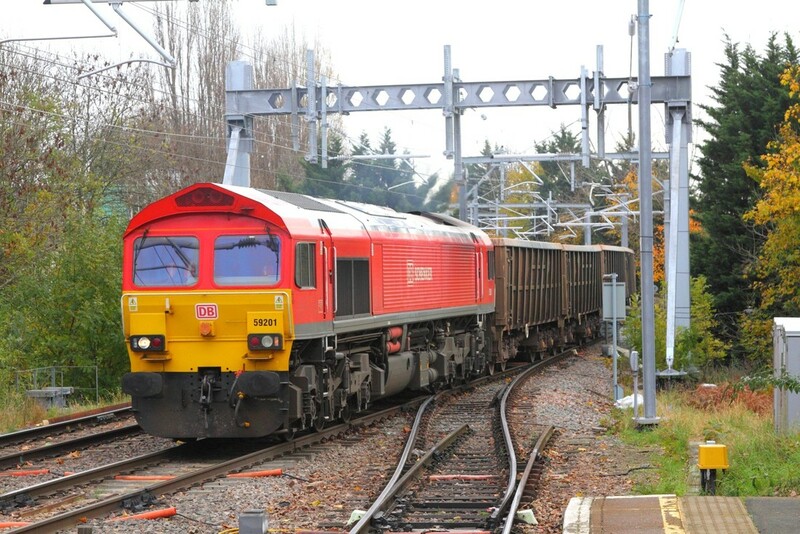 DB Schenker 59201 comes off the nearly electrified GOBLIN section on the North London Line with the 7V29 Purfleet to Acton yard at Gospel Oak on the 14th November 2017. 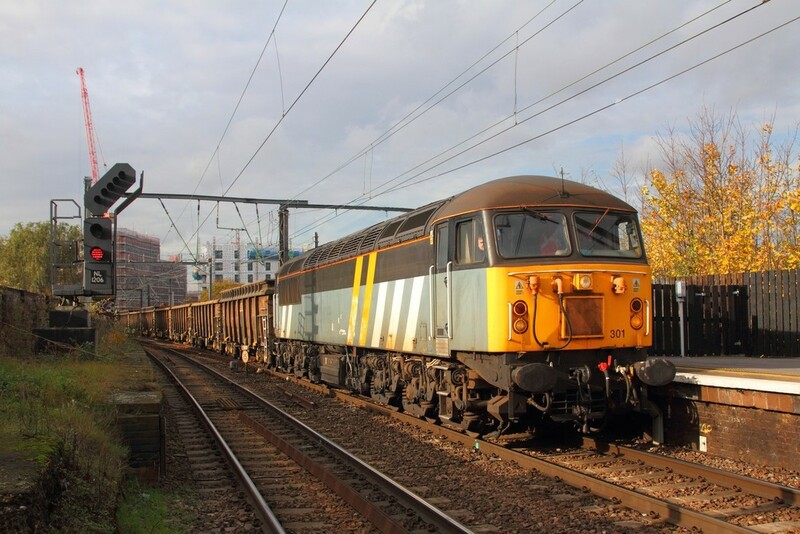 ROG 47848 and 47815 power the 6L74 1100 Wembley to Barrington Unloading PAD at Camden on the 13th November 2017. 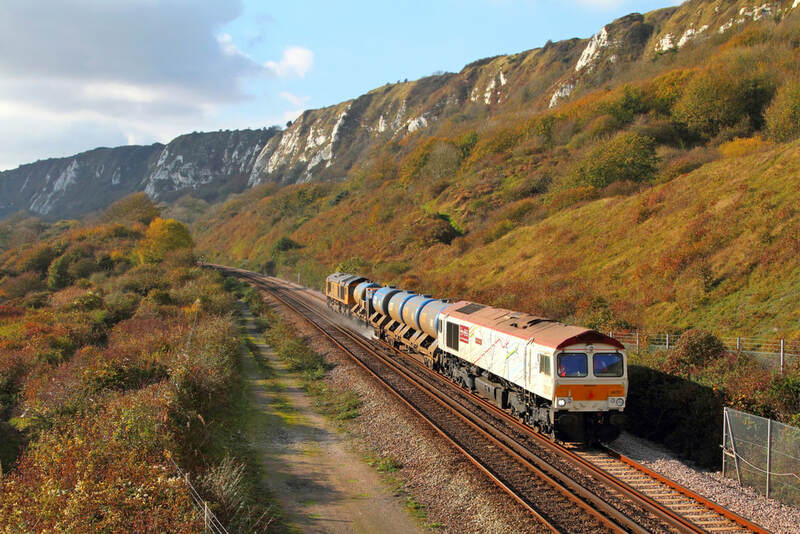 Battery locomotives Nos. 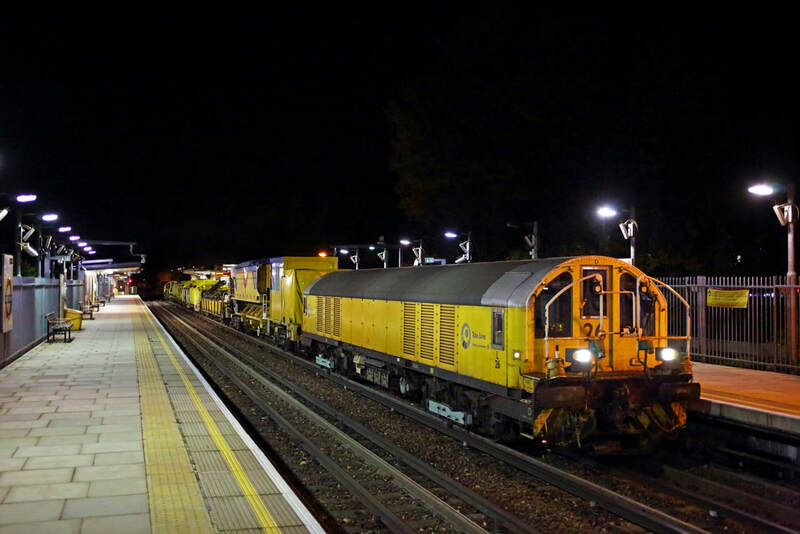 L26 tnt L28 work the 2006 Ruislip depot to Baker Street at Ruislip Manor on the 12th November 2017. Many thanks to Jason Cross for the heads up. 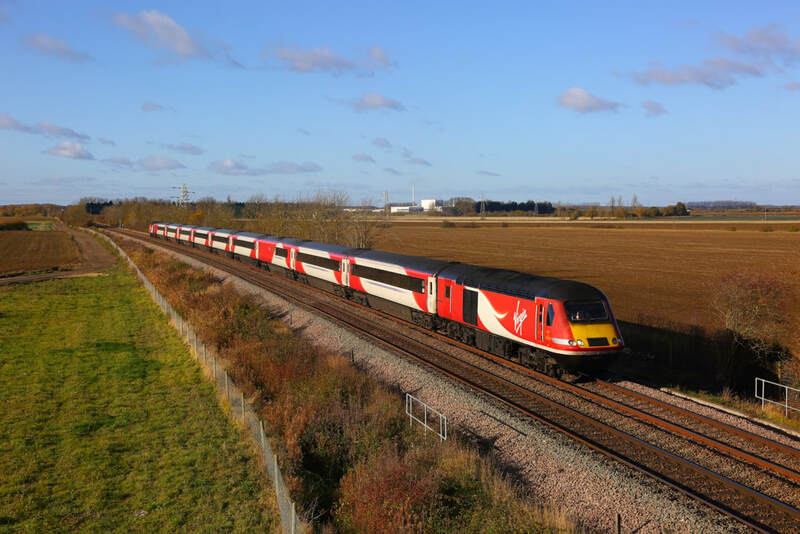 Virgin Trains East Coast ​43305+43318 on the 1E09 Edinburgh to London Kings Cross at Kirkby la thorpe on the 12th November 2017. 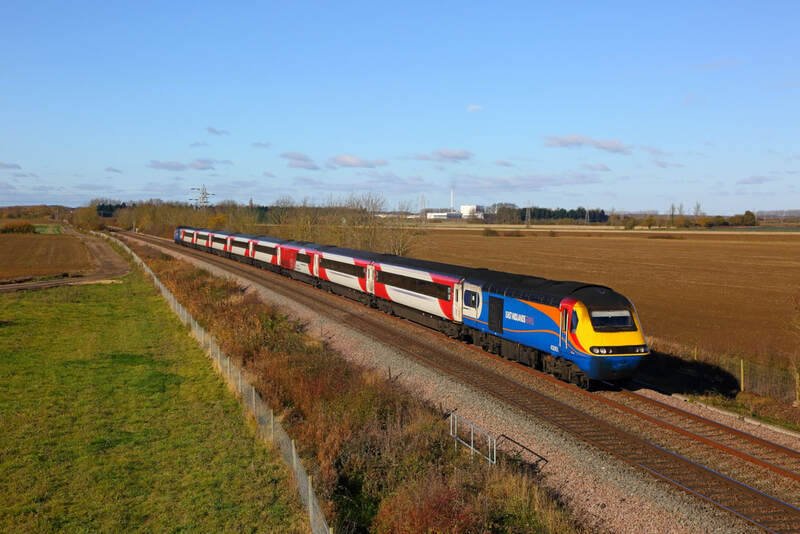 East Midlands trains 43061 and 43050 work the 1Y20 0855 Newcastle to London Kings Cross at Kirkby la Thorpe on the 12th November 2017. 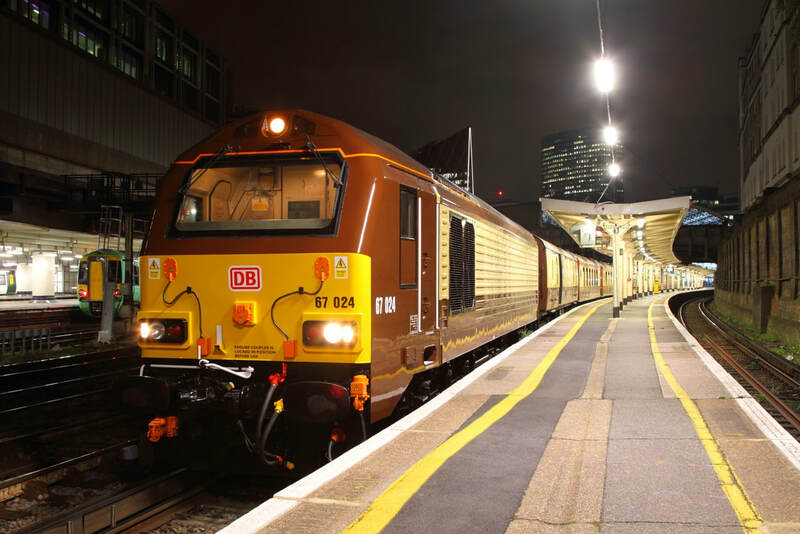 DB Schenker Silver Skip No. 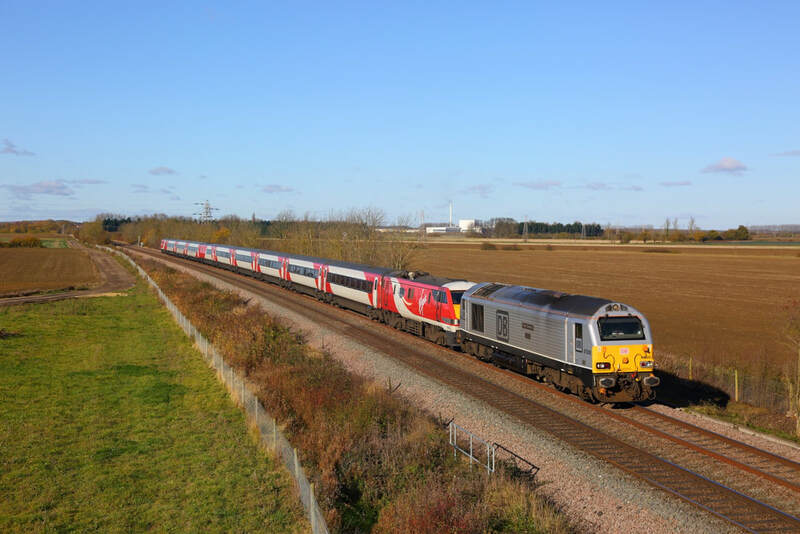 67029 leads Virgin Trains East Coast 91130 on the 1A19 0905 Leeds to London Kings Cross at Kirkby la Thorpe on the 12th November 2017. ​Many thanks to Bill for the info. 59005 on the 7A09 Merehead to Acton yard at Hungerford on the 6th November 2017. 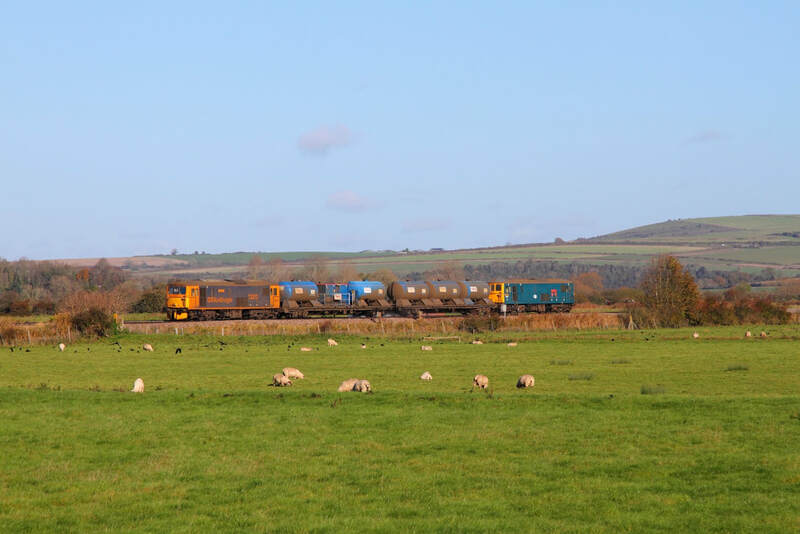 GBRf 73213 tnt 73201 on the 3W91 0920 Tonbridge west yard circular via Havant and Bognor Regis at Arundel Castle on the 5th November 2017. 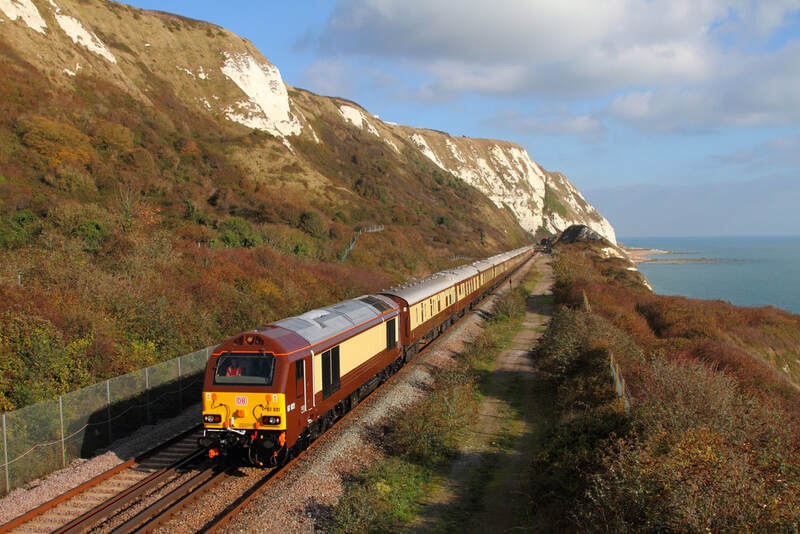 GBRf ​73213 tnt 73201 on the 3W91 0920 Tonbridge west yard circular via Havant and Bognor Regis at Arundel on the 5th November 2017. 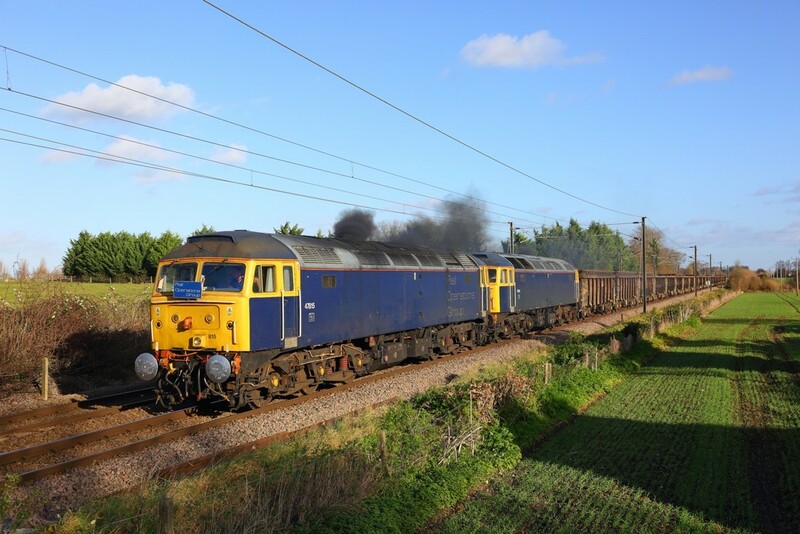 Br Blue 73201 "Broadlands" leads 73213 on the 3W91 Tonbridge West yard circular returning from Havant to Bognor Regis via Barnham at Woodhorn, Oving on the 5th November 2017. 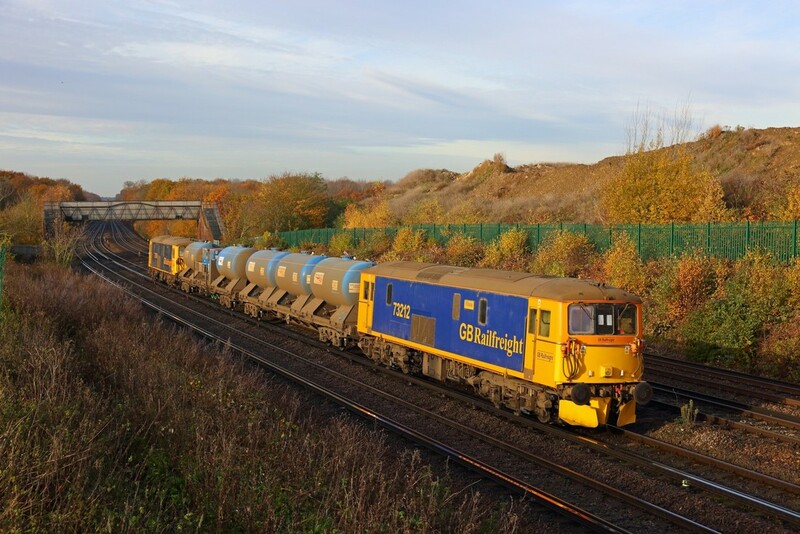 GBRf Tube Map 66721 tnt 66719 on the 3W02 Tonbridge West yard circular via Minster at Capel-le-Ferne on the 2nd November 2017. 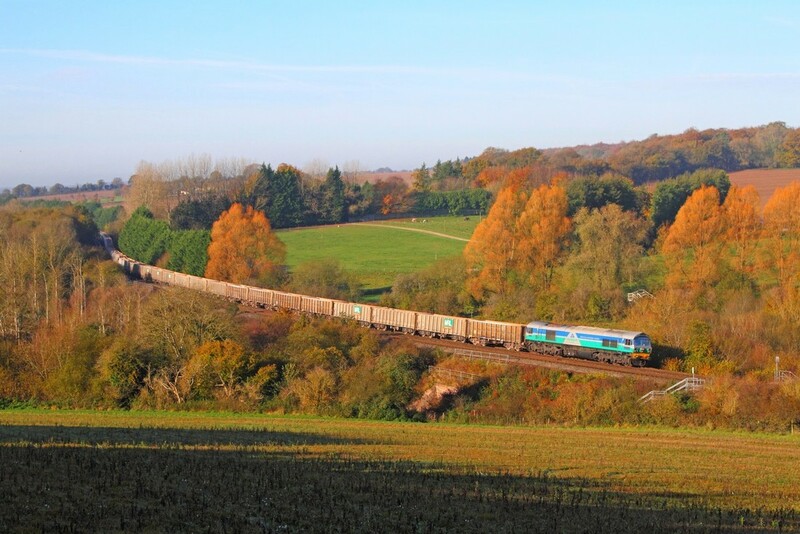 VSOE liveried 67021 tnt 67024 on the 1Y46 London Victoria to Folkestone West at Capel-le-Ferne on the 2nd November 2017. 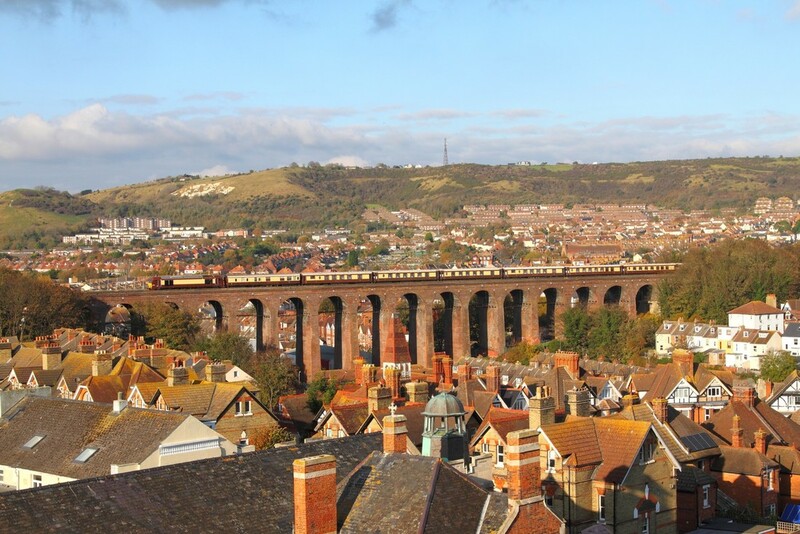 VSOE ​67021 tnt 67024 on the 5Y46 1310 Folkestone West to Folkestone East Train Road at Folkestone viaduct on the 2nd November 2017. VSOE 67024 leads 67021 on the 5Y45 London Victoria to Stewarts Lane at London Victoria on the 2nd November 2017.